I’ve already mentioned it a million times (what can I say, I like to talk about races! 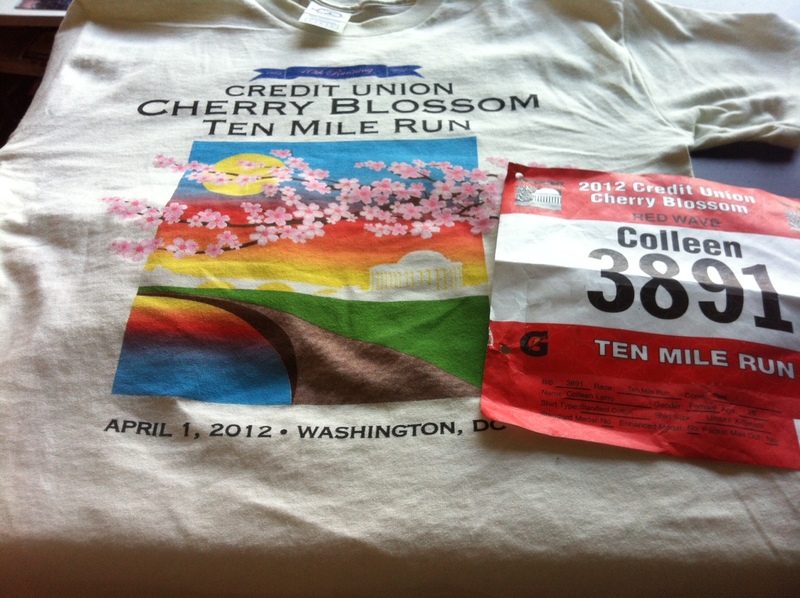 ), but for those that don’t know, I’m running the Cherry Blossom 10 Miler on Sunday. I’ve done this race twice before and it’s one of my favorites. It’s a crowded race, but also a fast and flat course. It travels by so many of the great Monuments and sights throughout D.C. that I get to take in on so many of my daily runs, so it’s not surprise I love it. I technically don’t have plans to race this as it is supposed to be a training run along the way to my goal race – the Nike Women’s D.C. Half Marathon coming up at the end of the month. However, I’d like to run it at my half marathon goal race pace, which is 7:30, and that would actually be a 10-miler PR for me. 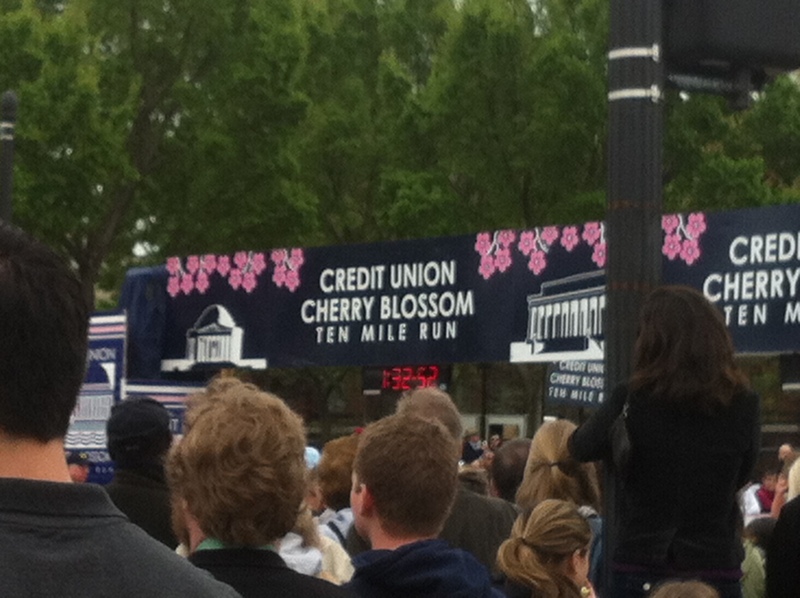 I set my current 10-miler PR at last year’s Cherry Blossom race with a 7:40 pace. Seeing as this course is very similar to the half I’m preparing for, it will be a great test to see where I’m at. I’m planning to pick my packet up Friday afternoon around lunch time. I know it’ll be busy then, but they did a good job of handling the rush at this time last year and it keeps me from having to get out to the Expo on Saturday when I’d rather be relaxing and getting my legs ready for race day. Before I even get to that though I’m treating my legs to a deep tissue massage after work today. They might hurt during the massage, but it sure makes a difference and leaves my legs feeling so much better after. On Saturday I will get all my clothes and gear out and ready, and map out a plan with Ian for where he can see me along the course and how we’ll meet up after. I try to get some good carbs and protein in at dinner the night before a race too. I also like to go over the course map one last time and make sure I know where the water stops are. I drink a ton of water all the time, but I try to pay special attention to it on pre-race days. On Sunday morning the plan is to get there early since I know it’ll be crowded and I want to get a good spot in my corral. My mantra for this race will be to START SLOW, FINISH FAST. I am the absolute worst at this and have never executed it successfully in a longer race. I know I need to get better at this so I don’t ruin my entire race in the first couple miles. I’ve always had a tough time with knowing my pace, but getting the Garmin has helped out a lot with that. I’m trying to decide whether to line up with the 7:30 pacer or not. Last year I did and we went out so much faster than that pace that I lost him at mile 2 and it really hurt me down the stretch. This is going to be a game-time decision for me. I might even try to find the pacer beforehand and ask him/her what the plan is for the first couple miles. The Hains Point portion of the course definitely got the best of me last year, but I’ve practiced running on it so many times since then that I am SO ready to take it on. My biggest fear for that section of the course is a windy day. I really struggle running into the wind there. How do you all feel about drafting? If it is super windy and I tuck in behind someone bigger than me is this wrong since realistically there are not too many others I could return the favor for since I’m only 5 feet 4 inches tall! Regardless of how I do I plan to have fun. I love running, but these are the days that I put in all the hard work for and I don’t want to let it go by without enjoying it! Are you racing this weekend? Let me know where and hope to see you if you’re doing Cherry Blossom too! This entry was posted in D.C., Fitness, Races, Running and tagged Cherry Blossom 10 Miler, cherry blossoms, D.C., fast, pace, pacer, prep, race prep, racing, running, windy by Colleen Lerro. Bookmark the permalink. Good luck on Sunday! I’m planning to take it pretty easy Saturday, and of course get to the start early so I have plenty of time to get settled in. I’m making sure to drink plenty of water all week long so that I’m well hydrated Sunday morning (especially since it’s looking to be fairly warm). Thanks, you too! Sounds like you’ve had a great training cycle for this race from following your blog! Maybe we’ll run into each other prerace Sunday…I’m planning on wearing a white hat, white tank w/ my blog logo screen printed on it (nerd alert), black shorts and white calf sleeves – plus red arm warmers depending on the weather.